Steven had planned an outdoor picnic birthday party for his son until the weather forecast revealed a very wet weekend! He contacted us to see if we could help and we were able to advise on a package that would fit in the venue he had secured. Steven selected the ultimate party package with the piggy deluxe bouncy castle and added an extra magic ball pool for the toddlers at the party near Bourne..........."We booked Funtime Bourne last minute after a bit of weather scuppered our original plans, and they were amazing! So accommodating and helpful, the party package we ordered with Bouncy Castle, ball pool and little cars were just fantastic.Excellent service, product and price, can't recommend highly enough." Suzie was looking for children's party ideas when she found our website. 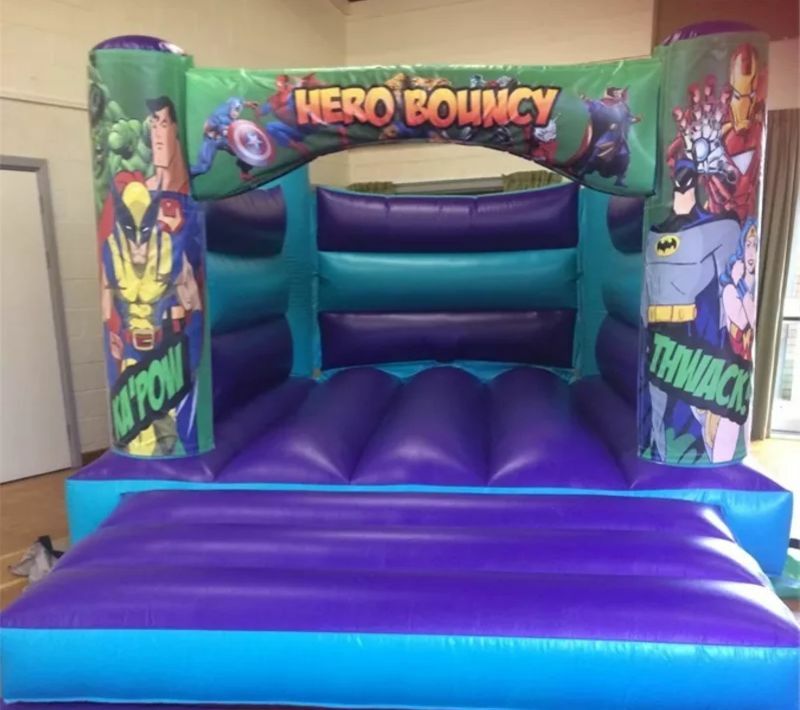 She chose the ultimate party package and teamed it with the superheroes bounce and slide bouncy castle for her party in Bourne. What a great choice! Here's Suzies lovely review of us............"Fantastic company, great value for money. We really appreciate your help in making our little boy's 4th birthday special! " Sascha left us this lovely review following her hire of our disco dome bouncy castle. Don't forget Funtime Bourne offer bouncy castle hire in Bourne and all the surrounding towns and villages................... "Amazing service! On time, efficient, and affordable. Lovely friendly couple, will use again and recommend to all our friends. All the best to this business"
Here's a really nice bouncy castle review from a lovely repeat customer on Facebook. Leah chose our ever - popular piggy bouncy castle for her son's dedication day................ "Great service, very friendly. Everyone especially loved the candy floss. Definitely recommend." Donna ordered our amazing hot tub party package complete with gazebo, sound system, lights and sweet stand for a very special birthday. She was delighted with the service we provided and left us this glowing review............... "We hired the Hot Tub package for my 50th birthday party and it was amazing. My Grandson refused to get out of it ! I would recommend this company to anyone as they provided a professional and friendly service. I must say that I cannot wait until we hire it again! Thank you Funtime for a wonderful experience." With all of your child's favourite characters featured on our eye-catchingbouncy castle you can't go wrong with this choice. 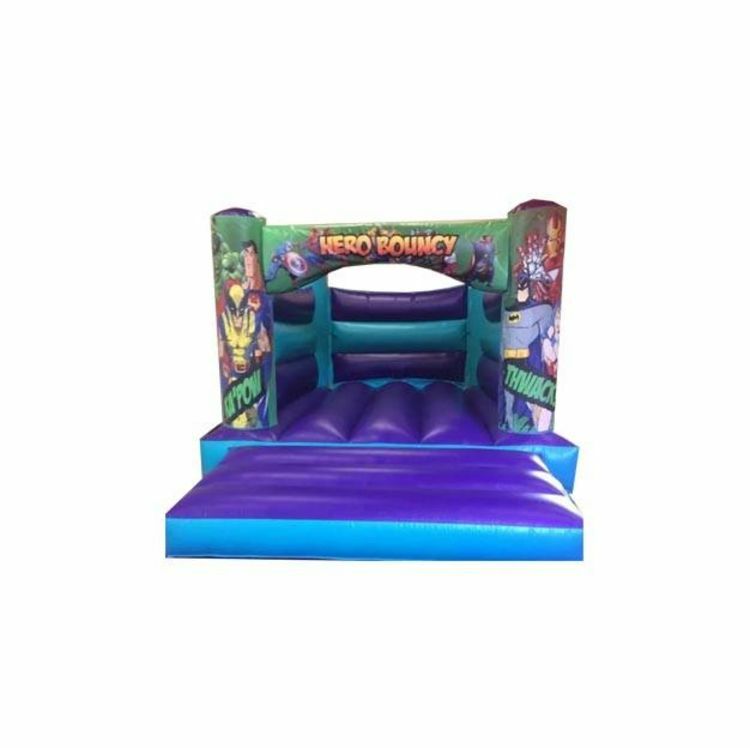 Our unisex Marvel Bouncy castle is a great choice for boys and girls, featuring all the most popular characters including Ironman, Batman and Wonder Woman! What could be better than a fancy dress party so the little ones really can become their favourite superheroes for the day? Don't forget that you can include this bouncy castle in our ultimate party package to give you sufficient entertainment for a full class party. Alternatively it can be teamed with our soft play party package to delight your babies and toddlers. This bouncy castle is available for hire in Bourne, South Lincs and surrounding areas including Spalding, Stamford and Peterborough. If you'd like to book this bouncy castle, please give us (Steve and Helen) a ring on 07592 3733310 or you can drop us an email here.